The chart below indicates the Fed's YTD open market treasury purchases. Roughly $32 billion in bonds/bills has been bought since the last update 2 weeks ago. The chart below can be traced back the Federal Reserve of New York's website here. 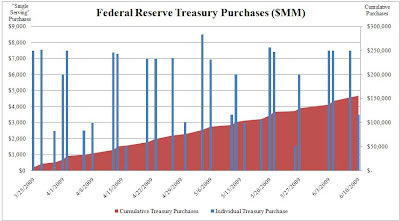 As the data indicate on the day of the $19 billion in 10 Yr UST, the Fed was concurrently bidding on almost $11 billion (of which $3.5 billion was accepted) of what most likely were 10 years: more than 50% of the full Treasury auction. Furthermore, the day before, the Fed purchased $7.5 billion in 3.5 - 5 years after submitting nearly $30 billion in bid requests. This is the same day that $30 billion in 3 years Treasuries were auctioned off at 1.96%. Has the Federal Reserve been keep the clearing price conveniently low by purchasing comparable trasuries on or near the days of critical auctions? Open market purchases seem to indicate that is in fact the case. In summary - last week's bond market exhibited unprecedented volatility: spreads between USTs and agencies fluctuated drastically, prices were all over the palce, the Fed was concurrently conducting OM purchases as the Treasury was auctioning off bonds in the primary market... cats and dogs living together, etc... And keep in mind total activity this past week was under $100 billion. There is still well over $1 trillion in bonds to be autioned off this year alone. If anyone is foolish enough to predict just what will happen with the long bond, the 2s10s, T-bills, etc. by year end, please speak up. Just How Many Regulations Is Goldman Exempt? Did It Look Like This? 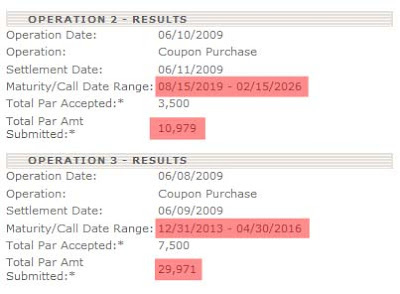 Is Market Pricing In A 2012 Forward Multiple? Can We Get This Guy On CNBC?